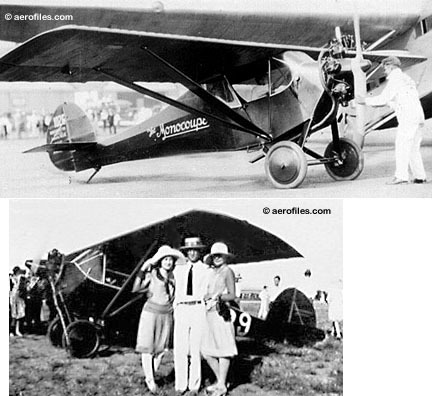 1928: Reorganization of Central States Aircraft Co as Mono-Aircraft Corp (pres: Donald A Luscombe), Moline IL, capitalized by (W L) Velie Motor Co. May 1929: Incorporation. 1930: Mono Aircraft Div (pres: W L Velie), Allied Aviation Industries Inc. 1931: Reorganization as Monocoupe Corp/Lambert Engine & Machine Corp, Lambert Field, St Louis MO. 1932: Purchase of company by Phil Ball (owner of St Louis Browns baseball team) after the death of Velie. 1933: Don Luscombe leaves to form his own company. July 1934: Lambert Aircraft Corp. 1940: Monocoupe Aeroplane & Engine Sales Corp. 9/15/41: Reorganization as div of Universal Molded Products, Orlando FL. 1946: Monocoupe Airplane & Engine Corp acquired and renamed Monocoupe Aircraft of Florida (pres: Robert Sessler), Melbourne FL. 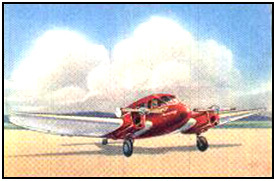 c.1992: Mono Aircraft Inc, Cheney KS. 19?? : Reported sale of TC to Saturn Aircraft & Engr, Oxnard CA. Midget 1931 = 1pOmwM; 40hp Lambert H-106. Chester Loose, Clayton Folkerts; ff: 5/10/31 (p: C B "Scotty" Burmood). POP: 1 racer , competed successfully in many events; rebuilt 1932 as Loose Special. Monocoach 201 1929 (ATC 201, 2-109) = 4pChwM; 220hp Wright J-5; span: 39'0" length: 26'8" load: 1173# v: 128/110/55 range: 550. Clayton Folkerts. Prototype [X8900] had 180hp Velie ML-9. $6,500; POP: 14 production, of which 6 were under (2-109). [NC100K, NC114K] converted to Monocoach 225. Monocoach 225 1929 (ATC 275) = 4pChwM; 225hp Wright J-6; span: 39'0" length: 26'8" load: 1217# v: 130/115/55 range: 530. $8,250; POP: 7 [NS22, NS33, NC114K, NC134K/135K, NC150K, NC164K], and 2 converted from Monocoach 201 [NC100K, NC114K]. Monocoupe 1 1928 = 2pChwM; 75hp Detroit Air-Cat; span: 30'0" length: 19'9" load: 484# v: 102/85/45 range: 400. POP: at least 5 [1427, 1474, 1885, 3430, 3531]. Monocoupe 22 SEE Central States. 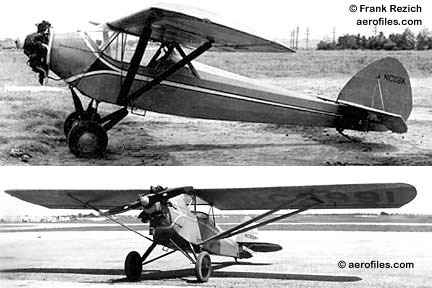 Monocoupe 70 1928 (ATC 70) = 2pChwM; 55hp Velie M-5; span: 30'0" length: 19'9" load: 215# v: 100/85/45 range: 500. Clayton Folkerts, Don Luscombe. $2,675. Monocoupe 90 1930 (ATC 306) = 2pChwM; 90hp Lambert R-266; span: 32'0" length: 20'10" load: 631# v: 120/105/48 range: 540. Evolution of Monocoupe 113. $3,375; $2,885 in 1933; POP (Mono and Monocoupe total): about 100 by mid-1934; line continued until 1957. Monocoupe 110 (Moline/St Louis) 1930 (ATC 327) = 2pChwM; 110hp Warner Scarab; span: 32'0" length: 20'8" load: 620# v: 142/120/45 range: 480. $4,500, $4,750 in 1931; POP: 50. First few built in Moline IL, then production was moved to Lambert Field. 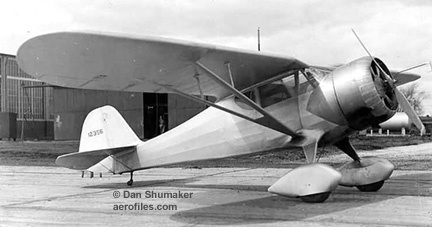 110 Special 1930 (ATC 327, 2-452) = Clipped-wing with 125hp Warner Scarab; span: 23'3" length: 20'5" load: 590# v: 185/155/60 range: 500. POP: 7 racers included one used extensively by Johnny Livingston in many winning competitions 1930-31 [NC501W]; one for 1930 Cirrus Derby [NX/NC2064] (p: Clayton Folkerts); one under (2-452) with 145hp Warner Scarab, possibly was prototype licensed as [NR101H]; one with 185hp Super Scarab. Monocoupe 113 1928 (ATC 113) = 2pChwM; 65hp Velie M-5; span: 32'0" length: 19'9" load: 502# v: 100/85/45 range: 500. $2,835 (the last 25 were sold in a 1930 "clearance sale" for $1,895); POP: more than 100. 113 Special 1929 (ATC 2-120, 2-146) = 110hp Warner Scarab; load: 650# v: 125/110/50. POP: 1 for Phoebe Omlie [NR8917]. 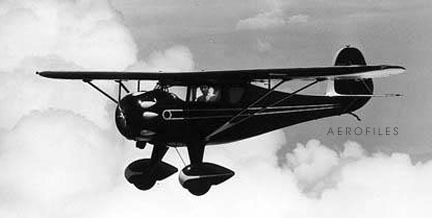 (2-146) for 80hp Armstrong-Siddely Genet, in which Omlie set a new altitude record of 24,500' on 6/29/29. Monocoupe 125 1930 (ATC 359) = 2pChwM; 125hp Kinner B-5; span: 32'0" length: 20'8" load: 583# v: 140/120/50 range: 420. Increased speeds with wheel pants and cowling. $4,750; POP: 4 [NS10/NC3771, NS21/NC13914, NC529W, NC797H]. Monocoupe 501 1930 = 2pChwM; 90hp Lambert R-266. Fred Knack. POP: 1, designed to replace Monocoupe 113, its performance proved to be inferior to Monocoupe 90. Monoprep 1927 (ATC 2-90) = 2pOhwM; 62hp Velie M-5; span: 35'0" length: 21'0" 85/70/35 range: 400. $2671; POP: 8 [C102K, C141K, C143K, C155K/156K, C159K/160K, C165K] c/ns 6069, 6025/6031 respectively. Monoprep 218 1929 (ATC 218, 2-128) = 2pOhwM; 55hp Velie M-5; span: 32'0" length: 21'0" load: 505# v: 90/80/45 range: 250. $2,675, $2,575 in 1930: POP: about 60. One long-nosed version was used to test one of the two Lambert H-106 motors in 1930. (2-128) for initial production replaced by (218). Monosport 1 1929 (ATC 249, 2-134) = 2pOhwM; 110hp Warner Scarab; span: 32'3" length: 21'5" load: 594# v: 125/110/50 range: 600. $6,350, $4,500 in mid-1930; POP: 9 [NC105K, NC133K, NC145K, NC152K, NC161K, NC167K, NC8957, NC8968, NC8974]; of which the first and last 3 were under (2-134). 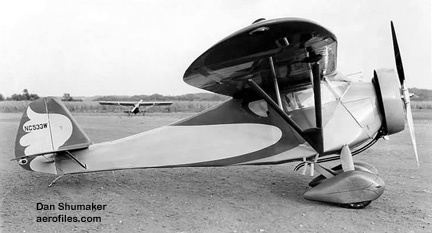 Monosport 2 1929 (ATC 250, 2-135) = 2pChwM Monosport 1 with 100hp Kinner K-5 and similar data. $5,750, $4,250 in mid-1930; POP: 7 [NC113K, NC136K, NC142K, NC144K, NC153K, NC8980, NC8989]. Also appeared on some regs as Monosport D.
70-V 1932 (ATC 492) = Mono Monocoupe 70 with 60hp Velie M-5; span: 32'0" length: 20'10" load: 567# v: 105/90/45 range: 500. A brief venture into economy aircraft. $2,395; POP: 2 [NC428N, x]. 90 Deluxe 1930 (ATC 306) = Mono Monocoupe 90 with 90hp Lambert R-266; span: 32'0" length: 20'6" load: 650# v: 135/115/45 range: 515. Ivan Driggs, Don Luscombe. $3,375; $3,485 with cowling, pants and flaps. 90-A 1936 (ATC 306) = Deluxe version of Monocoupe 90; load: 640# v: 130/112/42 range: 525. $3,485; POP: 150. 90-AF 1941 (ATC 306) = 90hp Franklin 4AC; length: 20'10" load: 612#. POP: 44; one with 100hp 4AC; load: 642# v: 132/117/45. 90-AW 1941 (ATC 306) = 90hp Warner Scarab; length: 20'6" load: 575# v: 130/115/45 range: 450. POP: 1. 90-AL aka 90-115 (Melbourne) 1947 (ATC 306) = 115hp Lycoming O-235; length: 20'12" load: 610# v: 135/120/45 range: 540. POP: 10. 90-J 1931 (ATC 355) = 90hp Warner Junior; span: 32'0" length: 20'11" load: 609# v: 120/100/48 range: 500. $3,950; POP: 2 [NC528W, NC530W]. 100 Special 19?? = 2pChwM; 145hp Warner Super Scarab. POP: 1 clipped-wing racer. 110 1932 = New production of Mono Monocoupe 110 with similar data. $4,485; POP: included in Mono 110. At the 1932 Nationals, 27 Monocoupes were entered and flew away with 28 cash awards. 125 1932 = New production of Mono Monocoupe 125. $4,350. D (90-X) 1931 = 2pChwM; 125hp Warner Scarab; span: 32'0" length: 20'5". Fred Knack, Ivan Driggs in 1933 for production version. A roomier version responding to complaints from tall and portly pilots. POP: 1 prototype for D-125 [X12356]. D-125 1933 = 2pChwM; 125hp Warner Scarab. [NC17687]. D-145 1933 (ATC 529) = 2pChwM; 145hp Warner Super Scarab; span: 32'0" length: 20'5" load: 636# v: 160/140/55 range: 560. Ivan Driggs. $5,600; POP: 29, of which 1 went to Charles Lindbergh in 1934 along with the transfer of his Spirit of St Louis registration [NX211]. Meteor 1955 = New design built in Florida as Meteor (I) and, perhaps, II. 4pClwM rg; two 150hp Lycoming O-320; span: 32'0" length: 25'0" load: 1350# v: 193 range: 800. POP: possibly only 1 [N5638]. Coincidental Meteor II was either a rebuild of prototype Meteor I or was Saturn Meteor (qv). Monosport D 1935 (ATC 2-134) = 2pChwM; 125hp Warner Scarab. POP: 4. Monosport G (Lambert) 1936 (ATC 2-542) = 2pClwM; 90hp Lambert R-266; span: 29'6" length: 18'6" load: 583# v: 128/110/45 range: 590. Al Mooney. 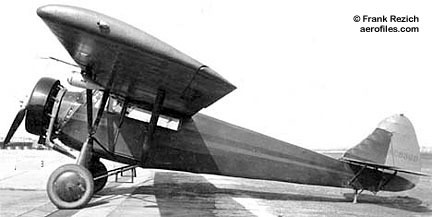 POP: 4 or 5; prototype [NC11791] had an open cockpit. Side-by-side seating. Planned for release in kit form, but the design was sold to Dart Aircraft in 1937 instead, appearing modified as Dart G/GK/GW. Monocoach H aka Zenith, Zephyr 1938 = 5pClwM rg; two 150hp Menasco D-4S; span: 36'0" length: 24'6" load: 1338# v: 152/139/50 range: 900. Al Mooney. Twin tail, retracting gear. POP: 2 [NX15433] modified into 4pClwM Zenith (with two 90hp Lambert R-266; load: 1265# v: 180/165/48 range: 565 ceiling: 15,000') and Zephyr (as military prototype briefly known as Wild-Cat), with supercharged D-4S). Also noted as Lambert Twin Monocoach.